To Dauphin Island! | My new trip on Roadtrippers.com! We are gearing up for another beach trip with the Airstream! The midwest is nice, but there is something that lifts your spirit at seeing the ocean. streamer_a is taking an official week off from work. I know Alfred is ready for some rolling in the sand. Happy Labor Day weekend to everyone! There are broadly speaking three categories of place to park an Airstream. Within each of these categories there is a range from good to bad, and these can change seasonally. After 10 months on the road these are our observations. RV parks are the absolute worst residential existence possible in an Airstream. There are no known exceptions. First, RV parks are surprisingly expensive. We have stayed in parks that top $40 per day. There are many much more expensive. $40 x 30 days a month = $1,200 / month. That’s a mortgage on a reasonable home in the Midwest. Second, while RV parks almost always have complete amenities (full hookups and laundry), they are designed to maximize occupancy. There seems to be an universally accepted standard layout to accomplish this: a one-way loop design with diagonal pull through spots set 10 feet apart inside the loop. On the outer rim of the loop will be back in spots, set 10 feet apart, and aligned diagonally to make backing in easier. The spots will be concrete or gravel, with utility hookups placed appropriately. Between the spots will be some grass. Or a dirt/gravel combo if you’re in the High Plains. Once you have completed your laundry you will hate everything about the park, quickly. Once you have walked around with your dog you will hate everything about your Airstream. You will start Googling how to sell it. You will remember fondly your suburban home, which shared much in common with an RV park, but at least had a fenced in back yard, a big screen TV and a bathtub. You’ll do the math on a mortgage vs. full time travel. The mortgage will start to seem like a good idea – and at $40 a day, it probably is. Shortly after you will fall into a depression and lethargy, questioning what your life has come to and whether there is any point to any of it. So why would you ever stay at an RV park? Location. If you need to be close to a specific place it may be the closest option. Get out as soon as you can. RV parks are only good for quick overnights on the road. There is no seasonal variability. State Parks are an improvement. They often provide the amenities you care about (full hookups and laundry). They are also, without any real exception I can think of, a vast environmental upgrade over RV parks. Some State Parks are even, well, quite pretty. They have trees, often a lake and some terrain. There are usually multiple campgrounds and a greater level of separation between sites than you would find in a RV park. The trees make a difference here too. They are also almost always much cheaper than a RV park. A rule of thumb seems to be one half the price of the local market rate at a RV park. In Kansas, there are fantastic state parks that cost $12 a day with full hookups. Think about that for a moment when you’re doing your mortgage math. In suburbia water, electricity and sewer utility bills alone cost more than $12 a day. More normal (i.e., not Kansas) seems to be $20-something a day. There is a downside to State Parks. First the experience is greatly subject to seasonality. We have found that during the high season — summer — they are crowded and on weekends/holidays you may as well stay in a RV park. This is the perfect combination of timing and location for the shirtless people. However, off season — winter — even the most popular state parks, in cold places, can be completely deserted. One quick cautionary aside: you may find that many state parks offer water and electric but not sewer. If you are staying more than two days I advise avoiding this scenario. What comes in must go out – and if you can’t get rid of it at your site then you are in blue-boy territory. Blue-boys are bad. As a subset to the State Park category I’ll include some commentary on National Park campgrounds and National Forest campgrounds. National Park campgrounds should probably be avoided in our limited experience. Sometimes they can’t be due to remoteness and unavailability of alternatives (Black Canyon of the Gunnison example). They are typically too expensive, too small, offer few if any amenities, and are always busy. National Forest campgrounds are hit and miss. They are, without question, absolutely over-priced. Ludicrously so, given they often offer no amenities at all. You find yourself boon-docking for $18 a day. But they are better than National Park campgrounds precisely because it is a more wild experience. The sites are usually much better spaced and positioned and the locations usually very scenic. I suppose the main objection to NF campgrounds is not the campgrounds, but the cost. Usually within just a couple of miles of a NF campground, you can wild camp in the National Forest itself. There are two forms of wild camping. The first is the quick overnight – the classic Wal-Mart parking lot. From there you can adventure into the interesting world of “stealth camping,” which is basically urban boon-docking. Interesting, perhaps, but not our thing. The second form of wild camping is the height of the art: going off into the “wild” (“wild” in the lower 48 is probably a stretch) and boon-docking without power, water or sewer, in a remote location with no-one else around. 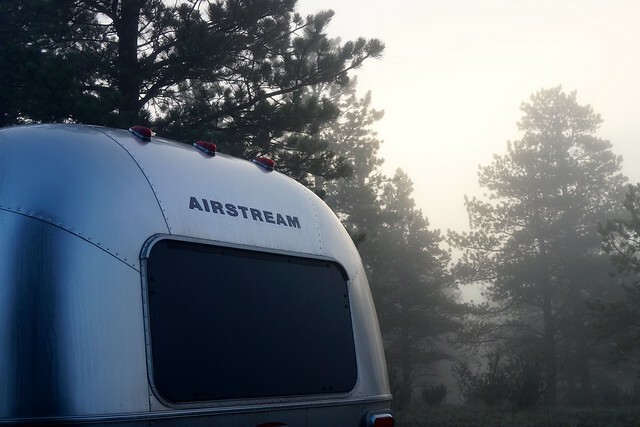 This is where your Airstream dream comes alive. The ability to do this is extremely location-dependent. There are entire states where this simply cannot be done (Iowa is an example). Tangent: Iowa has the least amount of public land in the US. Not a great state for any of this or much else come to think of it. You need to explore, which is part of the fun. We identify a target area of National Forest land on the map and utilize a combination of paper National Forest maps and Motor Vehicle Use Maps to determine where to try. Drive up, find a secluded spot, set up camp. What could go wrong (nearby landowners is the non-trivial answer – it’s a war out there – a subject for another post)? A high clearance vehicle is a must for this. Do not take an Audi up these roads. We learned this lesson at some cost. And although it has more clearance than a street car, a 28’ Airstream cannot get everywhere you might want to. But with care you can get to places you think you can’t. These wild camping experiences for us are inspirational. Truly – we don’t want to leave. So why do we? For me it’s the need to have some proximity to a work location and the need to travel overnight. streamer_j alone at night in the forest is probably not a great strategy for remaining married. Take the training wheels off, buy a generator (or solar, or both), and go wild.